Cricket fever is on -- while tension, excitement and nail-biting matches rule the air! With the ongoing Cricket World Cup, the talk of Cricket dominates every table talk. 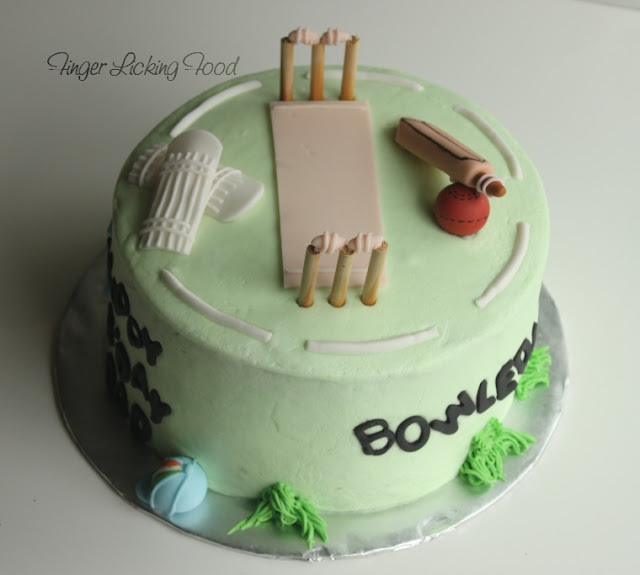 Recently a friend ordered this cricket themed cake for her husband's birthday. I couldn't have done this at a better time. It is a Chocolate Cake with chocolate icing in between the layers and frosted with vanilla buttercream colored a pale green to depict the grassy field. I have made a Cricket themed before, but I've added a few more details to this one. 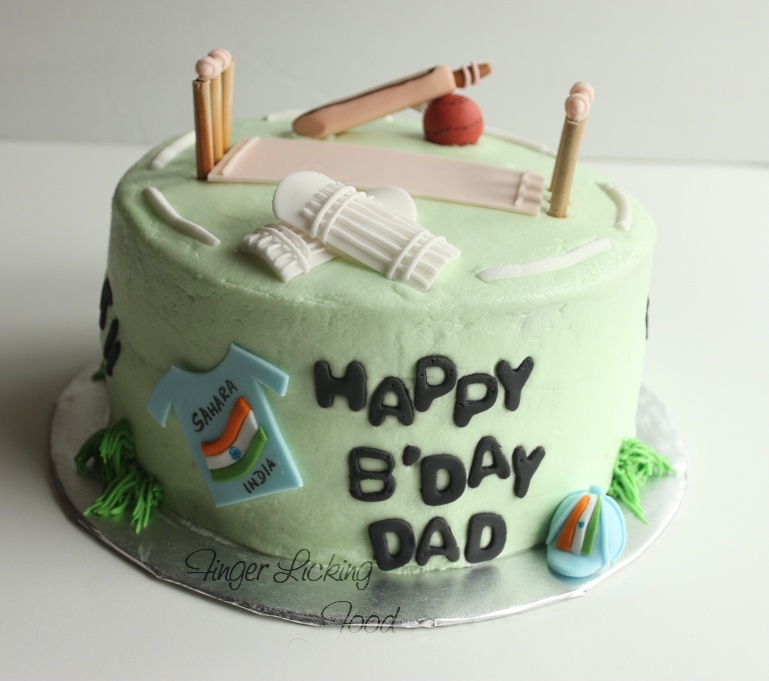 All cricket gear (except wickets) is completely edible and hand-made with a mixture of Fondant and Gumpaste. Fondant is rollable sugar icing, which can be easily molded and can be used to cover cakes to achieve a smooth neat finish. I am sending this Cricket themed Cake over to Priya's Crazy For Cakes Event. 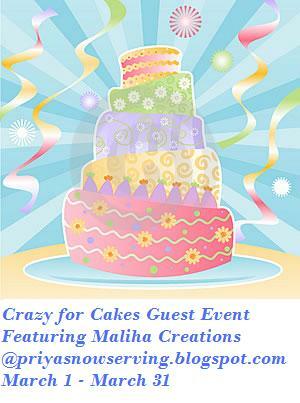 Thanks Priya, for letting me know about your event. 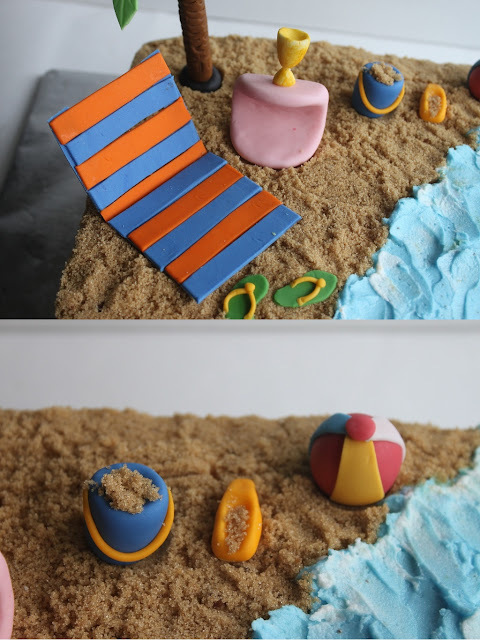 I am also sending this Beach themed Cake to the same event. With summer just around the corner, I figured it would be apt to send in something related to the season as well. This is a chocolate cake too, layered with chocolate icing. The icing on top is Vanilla butter cream colored blue. All beach items are hand-made using Fondant. Cream the shortening, vanilla flavoring and water until smooth. Add the powdered sugar and meringue powder and beat on medium speed for 2-3 minutes until smooth and combined. Color as required. You can use 1/2 cup shortening and 1/2 cup butter, the consistency will be different and adjust the amount of water accordingly. It may not need 4 tbsp. 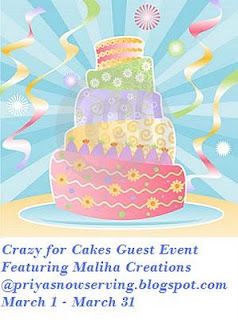 Omg, stunning theme cakes, marvellous..
what lovely and artisitically baked cakes with a cute and beautiful presentation, especially the cake with the cricket theme sets,its really droolworthy. Gorgeous cakes,loved both the themes,absolutely mind blowing. Amazing looking cake dear. Loved the look of both cricket field as well as sea beach. Must have tasted delicious as well. Wow I am bowled over by your decorating skills. 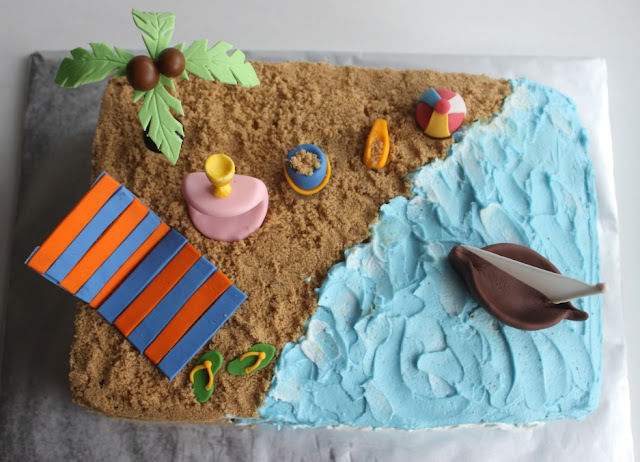 I love that cake that looks like the beach. How creative is that. Fabulous!! that is a very special treat indeed...pleasing to the eyes and inviting..
first time here...love your space and gorgeous clicks.. Wonderful idea for a theme cake. Both the cakes look awesome. So beautifully done Namratha! Hats off.